HomeStuffsThe Best Attack on Titan Action Figures on Amazon	No ratings yet. Attack on Titan can be a amazingly written plot and story with an extremely dark premise and much of actions. This is possibly not a series for the weak and soft of heart, especially those with fears of man-eating gigantic monsters that don’t even have the decency to kill human before they eat them. The plot keeps you speculating as it gets better, there is a new reveal that absolutely ruins what you expected and makes you ask yourself just how far this story goes. The characters on this series are really memorable and you really wish to see them have great results when it comes to battle. However,what makes this anime distinctive is the main characters extremely rarely ever win a fight. Every single mission and battle the cast engage in usually leads to a blood bath, but it is not without objective. The nasty deaths I saw just cements how high the stakes are in this anime, and the determination of main characters to push forward is really inspiring. Alright, I know you are really excited to see this anime, especially when it announced that it will be a second season in Spring 2017. 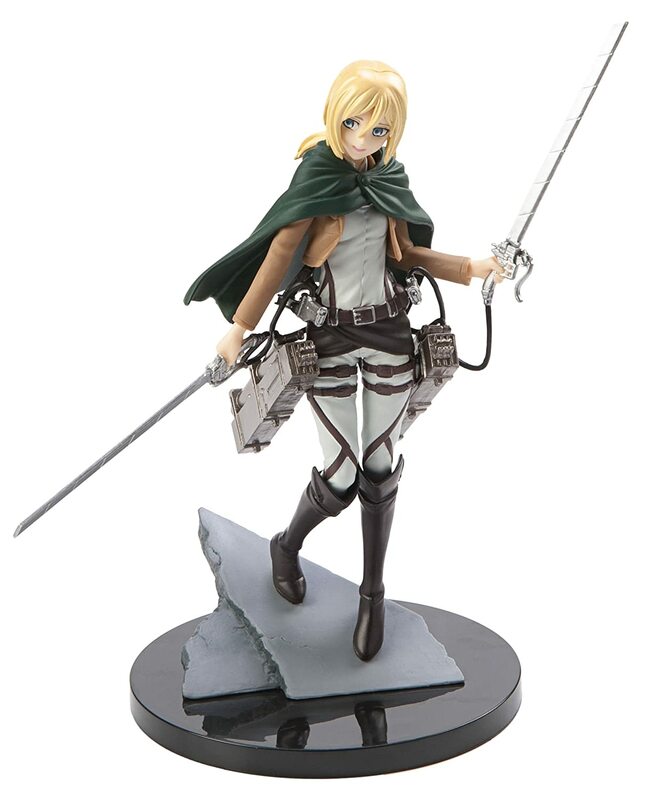 But the first season alone has gained so many popularity which makes people really want their physical items, such as Attack on Titan action figures. But also, so many people choose the wrong path by buying a fake, bootleg, and the poor one. So, we are Anime Bibly decided to help you find which Attack on Titan action figures that will be the best for you. Surprisingly, there are a lot of items on internet that will make you overwhelming. Researched from the biggest online store in the world, here are the 40+ best Attack on Titan action figures on amazon! Sold by Sega, this Levi action figures stands approximately 6,8 inches. It is brand new and officially licensed item. Levi appears to be fantastic. Sega did a decent work on this figure. The pose provides a lot of action, it is dynamic. It is just awesome all around. You must put Levi’s hands on, but it’s really effortless and you will find there’s picture to show you how to apply it. You also have to attach his feet onto the pedestal, and it is very simple. It is really detailed and is just as advertised. Hands and base are extremely easy to assemble. The painting is also pretty nice. I would surely recommend it to any Attack on Titan fans, especially if you choose Levi as your favorite character on the series. 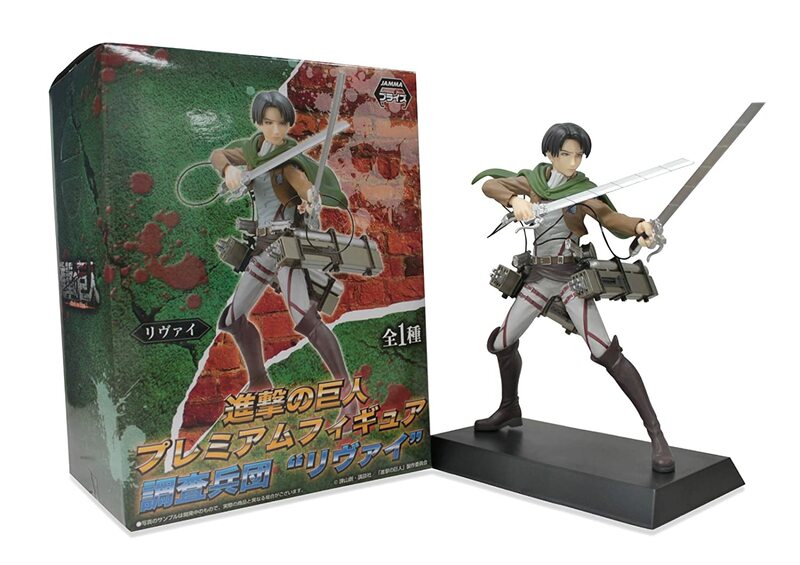 Sold and officially licensed by Banpresto, this Levy action figure is perfect for any Attack on Titan fans. The size is approximately 5″L x 3″W x 9.5″H. This figure is really well painted for with low price. It is approximately 9,5 inches tall and the upper body, stand, lower body, cloak and head are all separate but easy to assemble and take off. Please note that this doesn’t include the 3D Maneuver GEar but I think it is okay as it is still a pretty nice figure. He is painted beautifully and perfectly, everything is so nicely in depth even down to his furrowed brow. 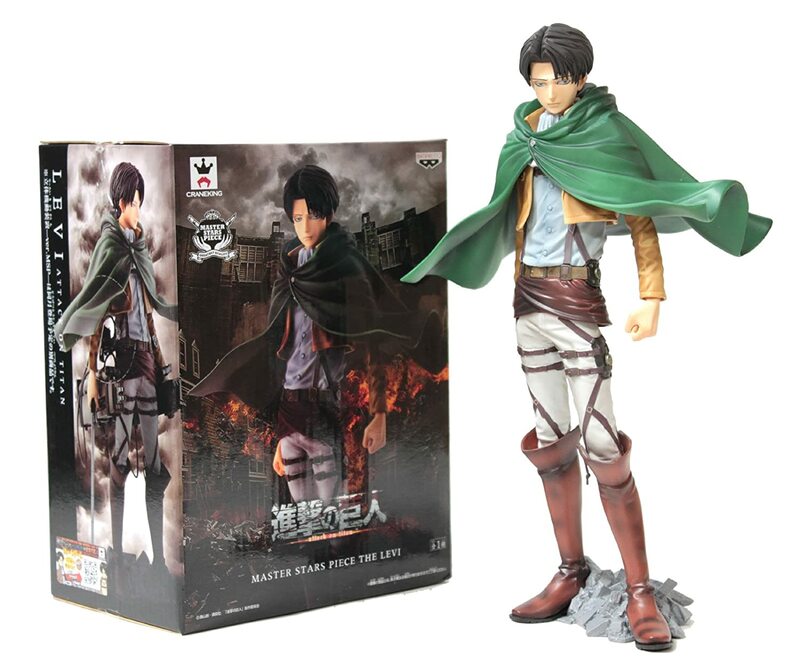 Sold by Banpresto, This 6.5-inch Levi action figure faithfully replicates the most popular character of the series. The figure details are exquisite and you will love how very easily it is to assemble and put the pieces together. The paint job is done so amazingly. This figure is precisely as described and pictured, turned out to be fantastic. 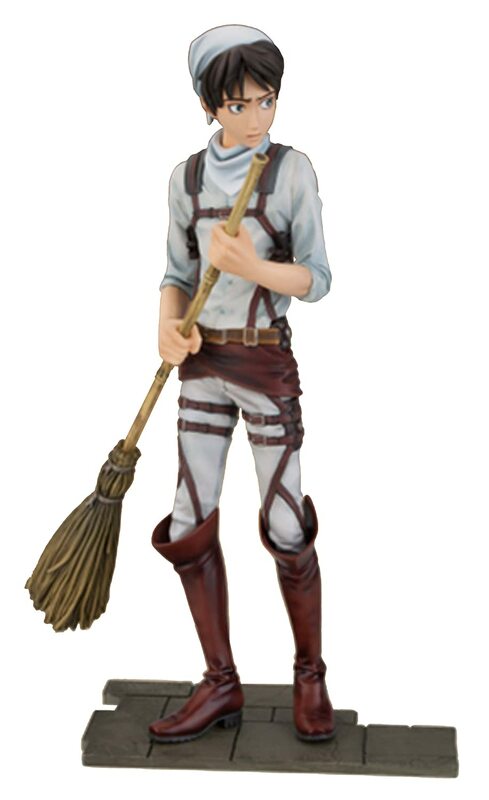 He appears to be wonderful, especially if you have him next to the Eren action figure cleaning version stands fit together. Painting and overall entire feel of the plastic isn’t completely poor, but Levi is an excellent little gem for the price you pay. Officially licensed by Sega, this action figure is cute and collectible. It is totally brand new and sealed inside retail packaging. The size is approximately 5″L x 4″W x 7″H. The figure is well designed, excellent details on all areas and parts, really accurate to the pictures displayed and is a good addition to your another Attack on Titan action figures collection on your desk or shelf. You will find a lot of detail and it is easy to assemble. All you need to do is put in the hands and put him on the stand. That’s all. Overall, this figure can bed a great item for any Levi fans lovers! From Sentinel, the Levi action figure stands nearly 8 inches tall. This figure recreates the leader of the elite Scouting Legion or Survey Corps from the popular anime TV series, Attack on Titan. The figure is finely sculpted and includes removable cape and poseable head. Levi is packaged really well, especially around the 3D Maneuver Gear. However, the only that is somewhat hard is connecting the cables to the gear because you need to take the apart to get the cables good and attached to back piece and side parts. It is really neat and includes manual that have easy-to-follow pictures and you will assemble it pretty easy and fast. The size and detail of this figure are excellent along with the good price. 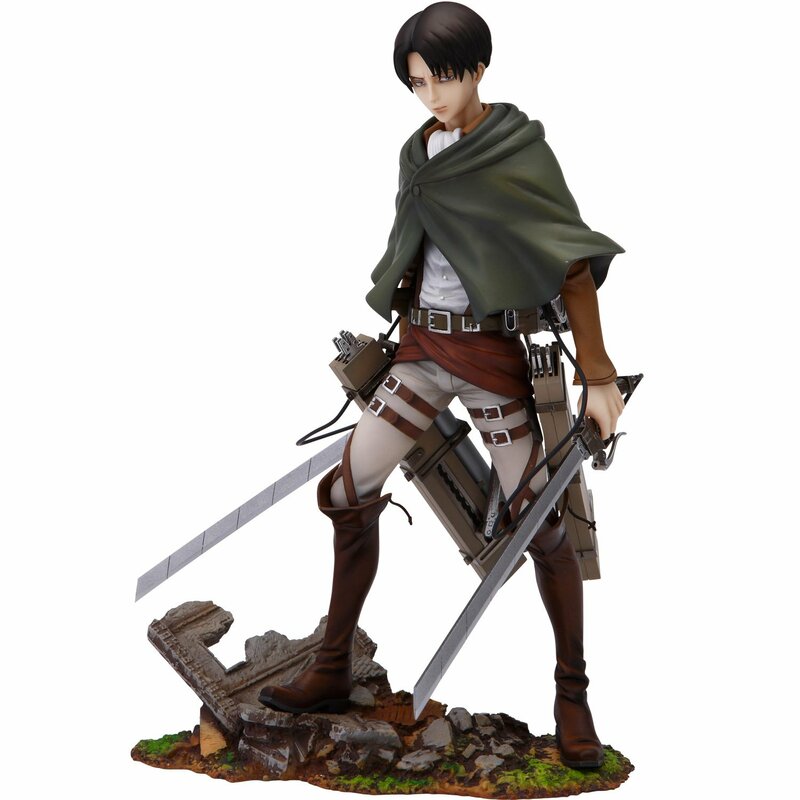 From Medicom Toy comes a wonderful new action figure of mankind’s strongest soldier, Levi! The leader of the Scouting Legion, Levi is recreated as a real Action Hero (RAH) figure that stands 12 inches height and features sculpting by Perfect-Studio, real looking fabric costuming including his Survey Corps cloak and a RAH male body allowing for flexible posing selections. He additionally comes along with 3 different facial expressions, 3D Maneuver Gear that fits swords, a movable stand and a bandanna, hood and 2 dusters! It is really awesome figure. The cape comes with a small wire in both the trip and the hood so as to even be posed. The stand is appealing in that you a small screwdriver to adjust it, and then it’s not the most secure, but does let for some wonderful poses with it. The additional blade ends that go inside the 3D Maneuver Gear are just that, little ends, not full blades, and appear as though they could easily fall out and get lost. The rope shooting out of the gear are extremely stiff. The hands are fantastic as they let the fingers to really be placed into the trigger area of the handles. This 11 cm Levi figure is totally brand new. The detailing can be perfect. 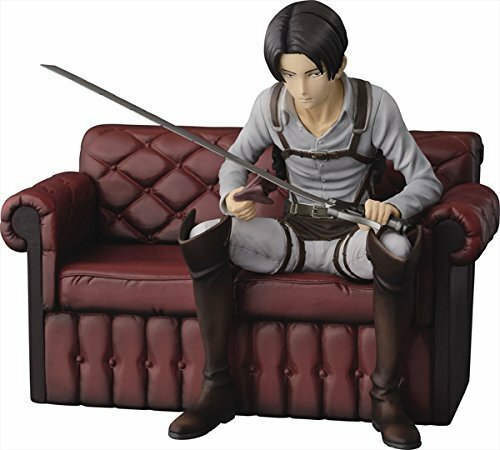 Levi himself is really light while the couch is on the heavy side which is wonderful cause that means less chances of it tipping over. It has floor like pedestal to position the couch on. The facial expression can be calm and soft. Another side of Levi that is really rare to see. 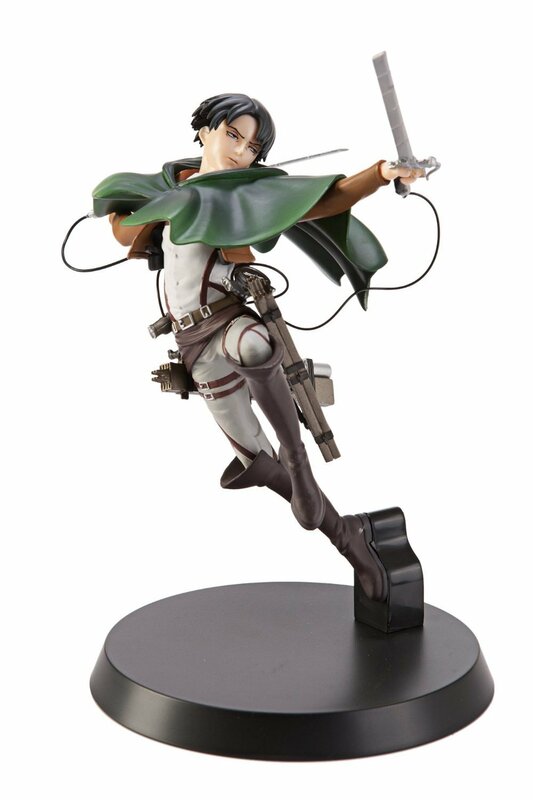 Sold by Kotobukiya, this Levi in posed mid-attack is beautifully sculpted in 1/8 scale. Levi features a removable green cloak for your choice of display with or without it. He will be look great if you pair him with Eren or Mikasa. He is really dazzling, from his dynamic pose to the severe detail all the way down to the tree branch base, wonderful! The whole thing about him is definitely perfection. His expression is just like him, so cold and casual as he is getting ready to slice into something. He doesn’t come with any accessories, but you’ll be able to take his cape off and you can replace the little white collar thing for one that is not so wavy. You will find a bit of assembly, but it is really just having to put the swords into the base and the attachments into the sword and 3D Maneuver Gear. It’s very easy. Despite the manuals are in Japanese, it’s still simple to understand and you won’t have any troubles. He is perfection. You really need him as Attack on Titan and figures fan. He is very worth it. The detail makes the price feel like a good deal. 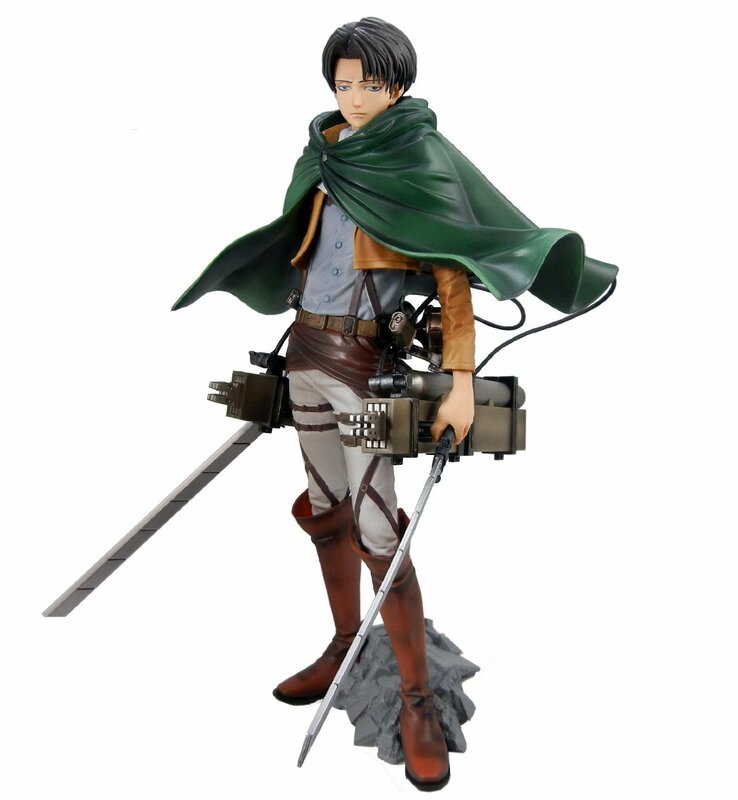 Sold and officially licensed by Banpresto, this Levi figure includes 3D Maneuver Gear. Banpresto has done well it again! For the how much money you spend the quality on this piece are excellent. This figure can be nice and large, along with amazing detail. What you see on the box is what you really get. No fake advertising. With this type of figure, it has two boxes. One of them is for the Levi himself and other is for his 3D Maneuver Gear. Be aware that putting together the Gear can be a little bit tricky, I might suggest that you assemble that before you put it on the figure. If you have been collecting lots of figures for many years or just started, I really highly recommend this figure in this series. 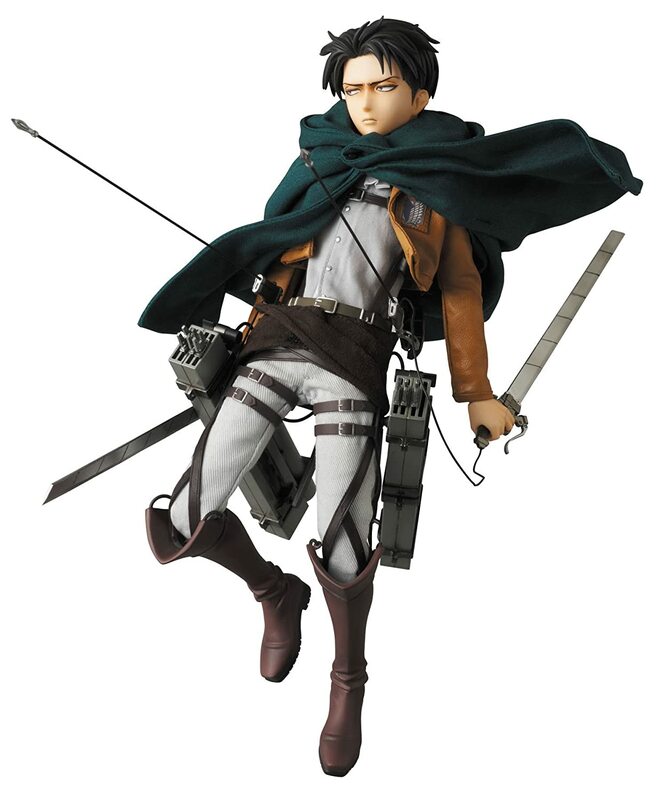 From the Good Smile, this Levi action figure is in 1:8 scale which include the stand in a Titan’s head form. He has been posed fantastically gliding through the air with his 3D Maneuver Gear as his Survey Corps cape flutters behind him. his stand is a Titan’s head that has also been properly sculpted to capture the attractive appearance of the Levi’s attacking. 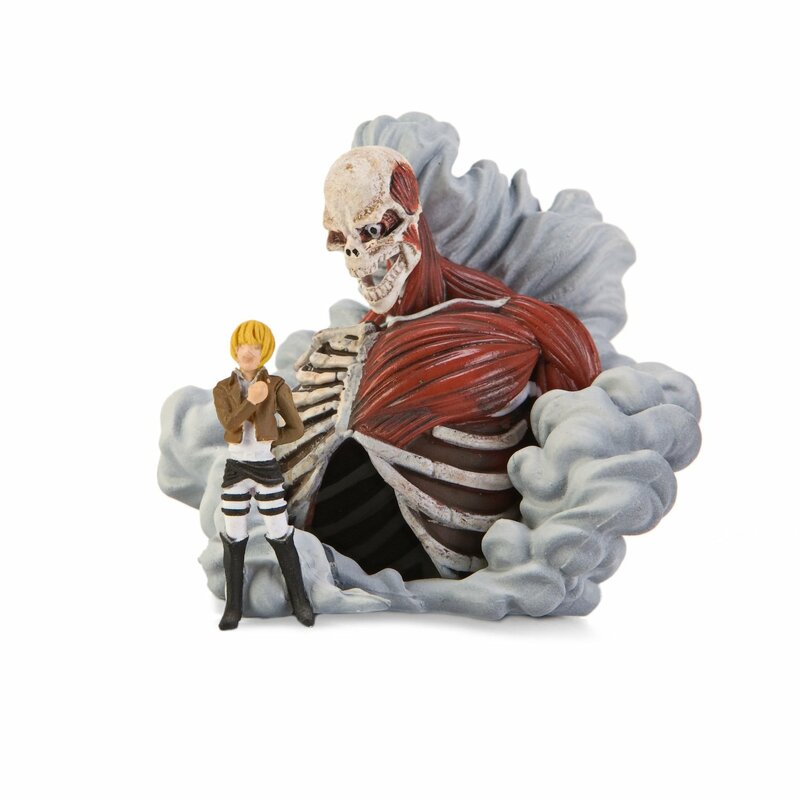 This single figure catches the atmosphere of the Attack on Titan world along with Levi’s character and the imposing Titan. 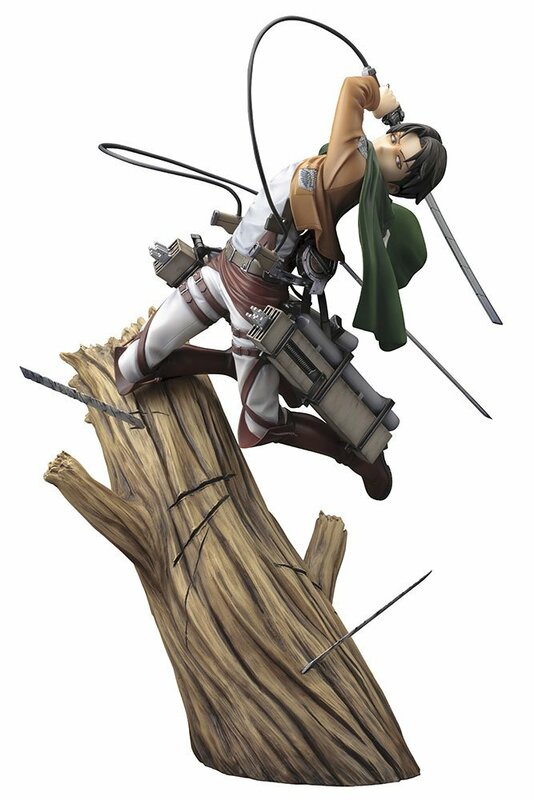 This figure is completely beautiful and a definite must have if you are a Levi fan. The painting is dazzling and accurate, along with the great articulation. But be very careful to connecting the 3D maneuver gear since it’s small parts make for sensitive pieces. 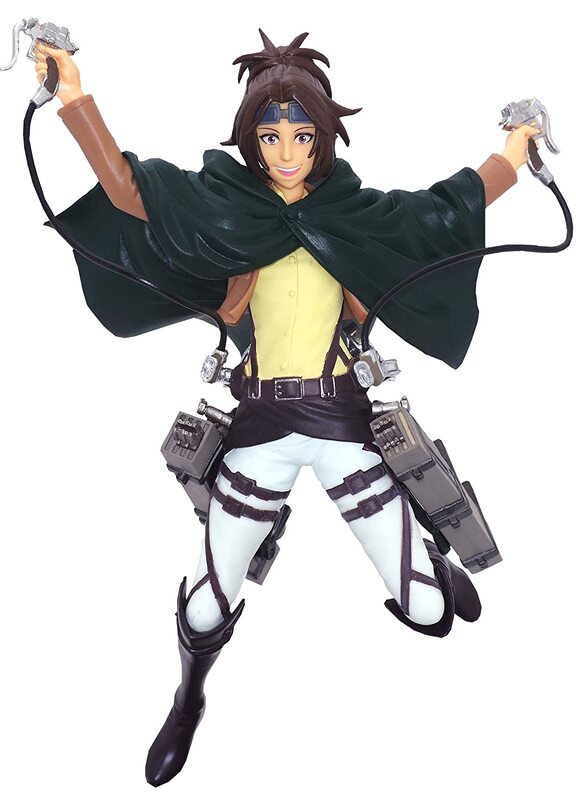 Sold by Banpresto, this 6 inches action figure is really replicates the main character, Eren Yeager. This figure is extremely wonderful! You will be thrilled with this purchase, it has wonderful details and it matches on its stand properly and it is certainly firm, the paint job from what I can say is utterly just beautiful. Even the broom itself appears to be amazing. The action figure is incredibly well detailed. Eren’s facial expression can be so cute. Really well made. Price is best for this Eren figure. Overall, the design is absolutely nice and the elements are easy to assemble together. 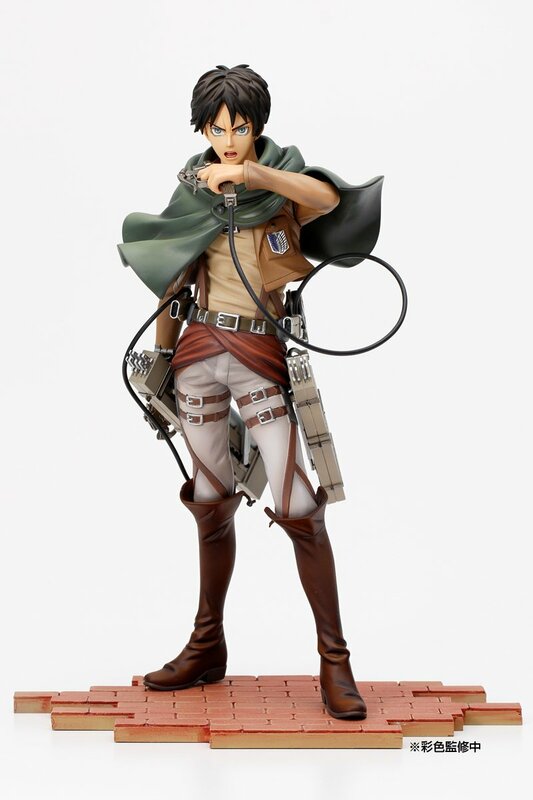 Sold by Banpresto, this Eren Yeager figure stands 10,3-inches tall. By combining with 3D Maneuver Gear, you can recreate cool posing based on anime series!! Collect them both. Each sold separately. The figure is big and highly detailed as well as made of sturdy plastic. The pose is wonderful and everything appears to be nice. No color blemishes or fading. Despite it is a little it tricky to attach the torso to the legs, but other than that it is an awesome figure for a cheap price. The contents of the action figure come inside a clear plastic bag with split sections of parts. The cave featuring Scout Legion logo is also removable, and the Vertical Maneuvering Equipment Master Stars Piece is also sold separately by Banpresto, creates an awesome add-on to the action figure as well. 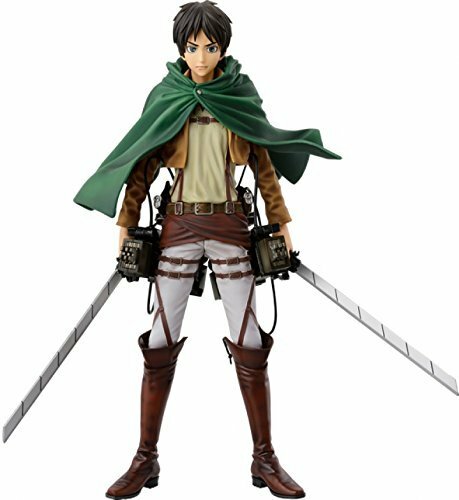 Sold and officially licensed by Banpresto, this item comes with 2 figures including Eren himself and 3D Maneuver Gear. The size of figure is approximately 5″L x 3″W x 10.3″H, while the gear is approximately 2″L x 5″W x 1″H. For less than $50 you will get a figurine with height and details of a $100+ figure. The quality of details is wonderful, the height is just perfect and the figure stands on its own. The 3D Maneuver Gear itself will take some patience to assemble as it’s somewhat flimsy but it appears to be good since this is a figure you probably will not have to deal wit it too much after you’re done. It’s really nice, very sturdy, good paint job, and just takes a little assembling and it comes with in two boxes. One for Eren himself, and the other for 3D Maneuver Gear. 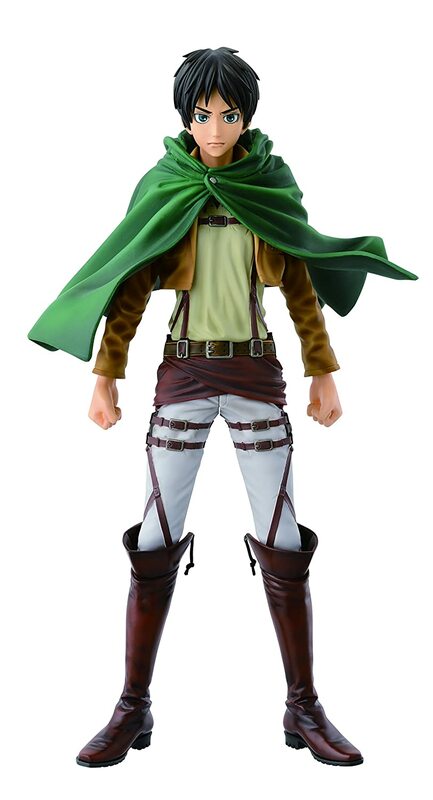 Sold by Sentinel, this Eren action figure comes with 3D Maneuver Gear and cloak. It is swappable left arm for those who recreate different pose. The figure includes display stand for you! The figure also has the rubber like wire to plug the 3D Maneuver Gear. Best of all the figure is extremely detailed, starting from the face to the clothing, the folds and creases, the 3D Maneuver Gear pattern, and even the stand. 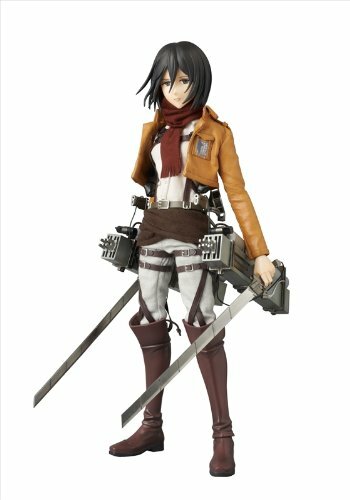 From the Max Factory / Good Smile Company comes the strongest girl in the series, Mikasa Ackerman action figure. With the smooth yet posable joints of figma, you will able to act out several different scenes. She includes three different facial expression: standard, shouting expression and with clenched teeth. She also comes with her dual blades for combat scenes, along with her 3D Maneuver Gear and smoke effects to replicate its use. The hooks linked to a wire that shoot out from the equipment are also included, as well as an additional scarf. You can find articulation in every joint in her body. Her paint job is perfect and the detail in her sculpting is utterly dazzling. The cloak’s sculpting to recreate it look like it is waving in the mid-are makes for some very cool poses. The cables that you can use to hang her are shockingly sturdy and won’t come out of the maneuver gear. 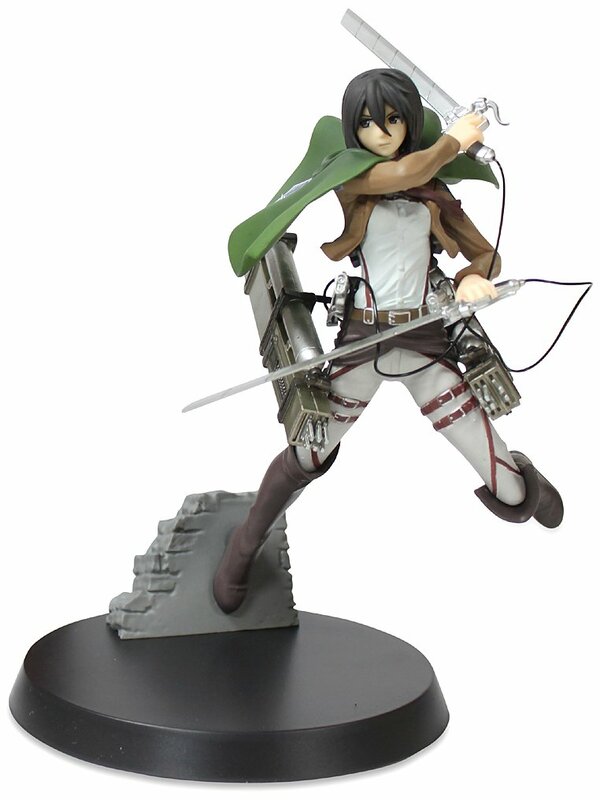 Sold and officially licensed by Sega, this cute beautiful Mikasa action figure stands approximately 7 inch. It is brand new and sealed inside the retail packaging. High quality figure. She stands exactly 7 inches on its stand and appears to be stunning! It comes in several pieces which are very easy to assemble. It is made with smooth, thick plastic and the detail can be wonderful. Usually people won’t expect to be have good quality product with the cheap price, but surely grab this one up if you are on a budget and can not spend the money for high-priced action figures. Assembly manual in Japanese, but you will find pictures, so no problems here. If you are just getting into Attack on Titan action figures and do not want to spend a ton of money, then fully grasp this figure. 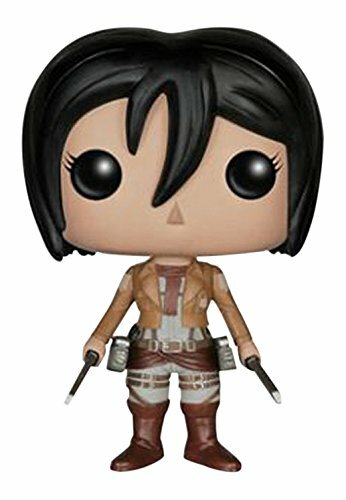 From the best character on the series, comes Mikasa Ackerman in Funkoy way. She’s beautiful! You won’t find any defects and the details and coloring are perfect! This FunKo pop comes with lots of great little detail and the paint job continues to wonderful! You will astounded at the quality of the small belt and swords. Her red scarf is even included and you can see the 104th trainee squad symbol on the side of her coat. It extremely has a lot of great detail. You will also love the package which had proper protection to avoid damage to the actual item. From Medicom, comes Mikasa Ackerman from the popular anime series Attack on Titan which is recreated as a nearly 12 inches tall Medicom Real Action Hero (RAH) with fantastic details that include a genuinely textured costume. 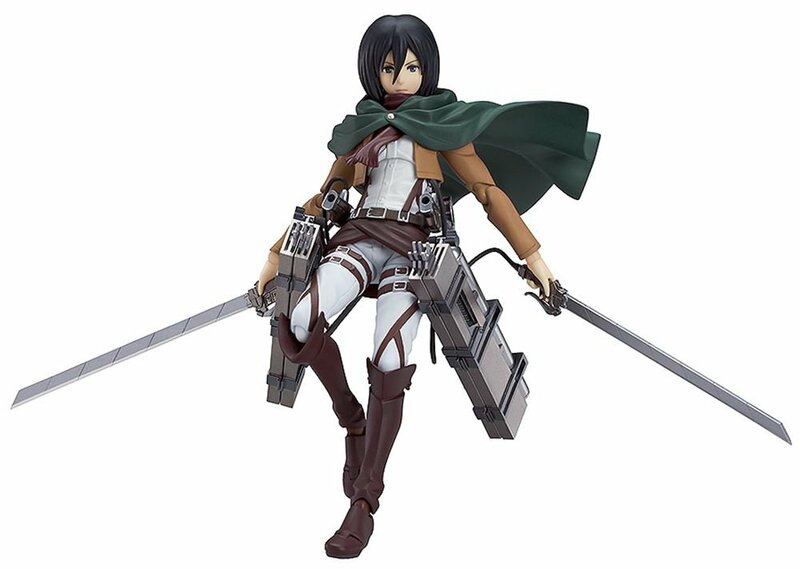 The costume includes her Survey Corps cloak, 3D Maneuver Gear, dua swords that can be positioned inside of 3DMG, 2 different facial expressions and stand, and a third expression for maximum posing selections. The action figure itself has clear base and a crane-like arm that sticks out of it, so that you can mount her in lots of flying positions. This works okay, but not the best. The problem is that the action figure can be heavier than the base and arm can hold, so sometimes you have to get creative in how you bend the arm-stand and where you position it above the base, so everything doesn’t topple over and break your flying gear or sword. Otherwise, the action figure appears to be wonderful! The clothing is excellent, crafted from real material and fabric. The only plastic elements are the boots, gear, and the belt. Everything can be pretty much stitched, at least looking from the outside. Her facial expression is beautifully crafted. She appears to be much like she stepped out of the anime show into your reality. This action figure can be a bit of costly, but most of these types of figures price in a comparable range. You will pay for quality and detail and with the Medicom RAH Attack on Titan Figure, you will be surely getting what you pay for! It’s really highly recommended. 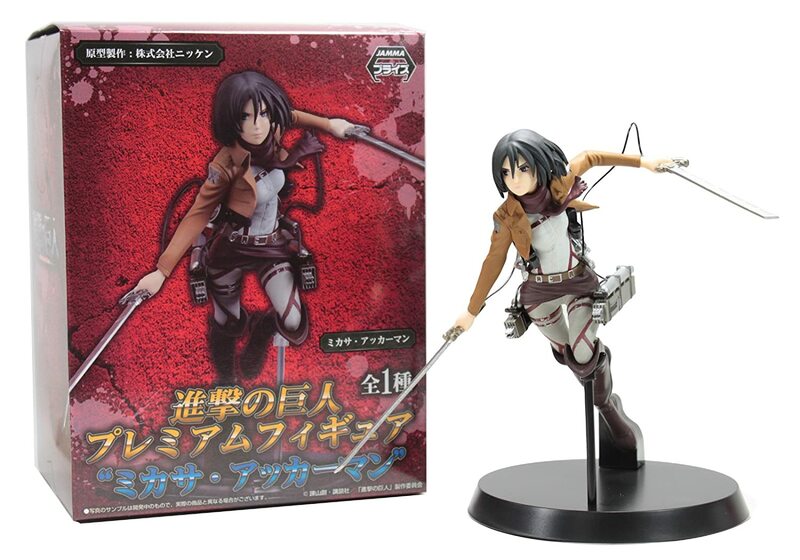 Officially licensed by Sega, this cute and collectible Mikasa Ackerman figure is great for you collection and gift. The size is approximately 5″L x 4″W x 7″H. The quality of product is no where near as great wonderful as of a $100 PVC figure, but the price itselfis really nice. And the prize figure, it is extremely detailed. Along with the wind on her cape and dual blades ready to swing, you can truly feel a sense of motion and energy looking at this in person. The paint job is not bad except around her hands, but even then there are a lot of small buts and pieces that the eye never truly focuses on it. It is very worth it for the penny. From Max Factory / Good Smile Company comes Armin Arlert in his action figure form. By using the smooth yet posable joints of figma, you can actually act out numerous different scenes. He has three expressions including his standard, a worried expression, and an emotional shouting face. He also comes with dual blades for fight scenes, along with 3D Maneuver Gear and smoke effects to recreate its use. The hooks attached to a wire that shoot out from the gear are also included, along with cloak of Survey Corps logo. It also has a stand, that enables several poses to be taken. The quality of details starting from the facial expressions, paints, the weapons, the additional accessories, and the amount of articulation figure itself is remarkable! You will be impressed at how this anime character were converted to 3D model in Figma! Sold by Taito, this Krista Lenz action figure is an officially licensed product. The figure itself is extremely well sculpted and amazingly painted with a lot of great paints. Her dual blades come detached form the main figure which also made it possible for you to clean before you set her up. Also, the rock is detachable from the base. It is really top quality figure. A lot of details, especially on the vertical maneuver gear. It is easy to assemble onto the stand and it’s quite sturdy while it sits upright to be lightly bumped without falling over. 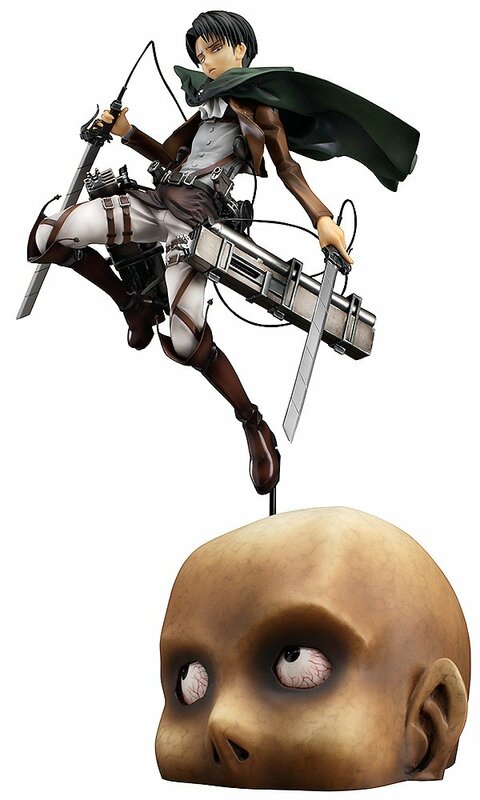 Sold by Taito, this Hange Zoe action figure is also an officially licensed figure for any AoT fans! She stands 7,5 inches tall. This can be a beautiful action figure for the price. Well painted and sculpted with almost no paint errors, especially just around the edges of the belts. She comes with a sturdy and clean black stand. please not that this figure doesn’t include her dual swords. Overall, this figure can be wonderful! The detail is surprisingly very nice. 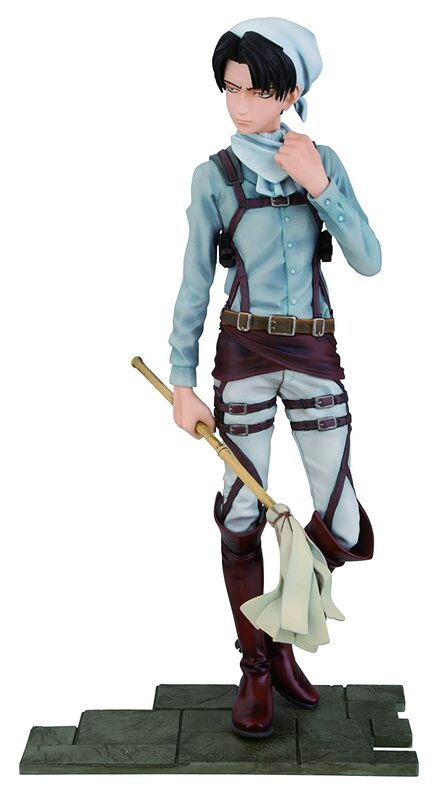 If you love Attack on Titan and love Hange as your favorite character, then this figure will be the best for you! 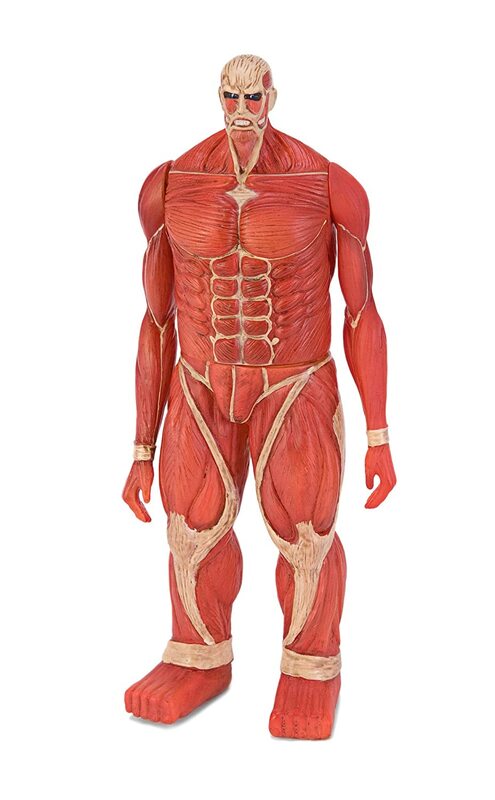 Sold by AnimeWild, this Colossal Titan action figures is an officially licensed product for you! Magnificent import from Japan! The figure itself feels rubbery. The detail and paint both on the body and face are above average especially if you look at the price. Waist and Arms are moveable, an awesome piece especially if you own another Attack on Titans action figures on your shelf or desk. They could pose next to this huge 8 inches Colossal Titan. You will love the action figure. It is bigger than the standard action figure. It is around 8 inches. It is also authentic and will work with another action figures. It is not probably the most sophisticated figma on the market but as close as you can get until the Good Smile make a release. 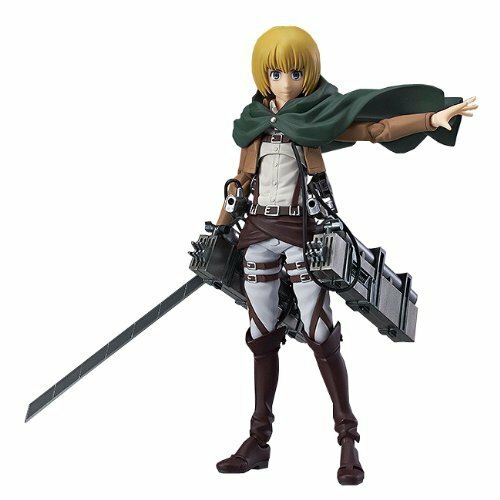 Sold by AnimeWild, this Armin and Eren Titan forms action figure is officially licensed product again! For being very small, the figure comes with a lot of detail on it, and the paint doesn’t look terrible at all. Just remember the fact that small items like these are not simple to paint and might look a little bit sloppy. But looking at this with the naked eye, they are really fantastic pieces! But as a message of warning, it is very small, about the size of an acorn. So if you are getting this for yourself, be aware of its tiny size. Don’t be fooled by the image which makes it appear to be bigger then it should. But still, overall it is very recommended product for you.